He depicts an heroic shoreline, a land that declares its own terms of surrender against a hostile, battering sea. Given that from the air Cape Cod resembles a single raised fist jutting into the sea, a heroic, Byronesque, cliff face is only appropriate. Beston built a house, a 20 x 16-foot cabin on the dunes near Eastham, Massachustts, along the Cape’s forearm, in 1925. 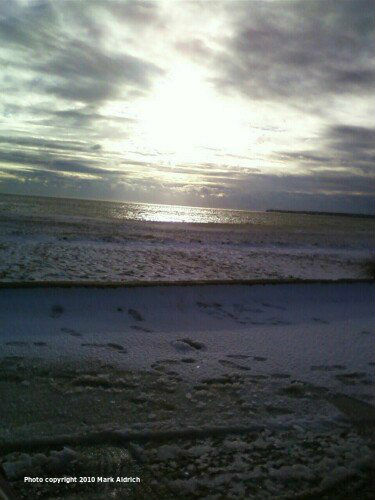 My photo was taken from near where Beston’s cabin used to stand. The dwelling faced the ocean, and its many windows offered him a view of the water that made him feel like he was on a ship. Thus he called the house the “Fo’castle,” but it became known as the “outermost house” for an obvious reason: it sat at what seemed like the end of the earth. Beston never lived full-time in his shanty, but he spent enough time there to write his book, which is subtitled, “A Year of Life on The Great Beach of Cape Cod.” Picking epic-seeming events from each of the four seasons he experienced gives his “year” an intensity of action and feeling. The book was published in 1928 by Doubleday. As a young man, I knew that I loved Cape Cod, for reasons of family and fun, but it was not until I devoured Henry Beston’s short, 218-page, book that I found the deeper reasons. It would be a beautiful thing if every place on our planet could have a writer fall so utterly in love with it, as Cape Cod had Henry Beston. (Perhaps I will be the Henry Beston of Goshen, New York.) Beston’s brief meditation on the slow, usually imperceptible rhythms of nature—imperceptible because few bother to perceive them and communicate anything about them—is written in a muscular language that makes the surf appear to have desires and dreams, the wind have language, the birds individual personalities. It is not easy to take memorable landscape photos; the camera may capture every detail of a detail-packed outdoors scene, but a photographer’s eye and hand is needed to direct our eyes to what he or she finds worth looking at. Otherwise, every beach snapshot is every other beach snapshot; they are all alike in their uniqueness of sky and sand. The nature writer has even more difficulties: he could fill his pages with yelps like, “It was such a stupendous night sky full of stars! You should have seen it,” and thus bore us with banal generalities, or, lurching in the other direction, bore us to tears with specifics. Beston finds the poetry in using the correctly applied terminology of whatever phenomena he describes. This was a revelation to my then twenty-year-old self. When the National Park Service was evaluating the arguments for establishing the Cape Cod National Seashore, Beston’s book was cited frequently in the report’s pages. Beston died in 1968, and a sentence from “The Outermost House” is his epitaph: “Creation is still going on, the creative forces are as great and active today as they have ever been, and tomorrow’s morning will be as heroic as any of the world.” The cabin itself, the Fo’castle, was swept away by the Blizzard of 1978, a nor’easter of heroic strength with historic effects; in other words, a storm that Henry Beston would have appreciated. The spot on the beach where the cabin stood, once atop the dunes, is now under the Atlantic Ocean, a portion of the Cape that the sea has reclaimed for itself. 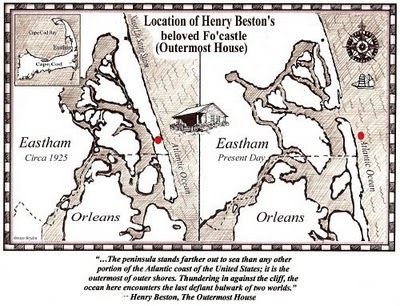 Henry Beston Documentary Trailer : Cape Cod from Mooncusser Films LLC on Vimeo. The above is a slightly edited piece I wrote in August 2014, “Falling in Love with Falling in Love with a Place,” which re-appeared in 2015.